Latin - Tenor Sax (Big Band Play-Along Volume 6). Composed by Various. For Tenor Saxophone. Big Band Play-Along. Softcover with CD. 24 pages. 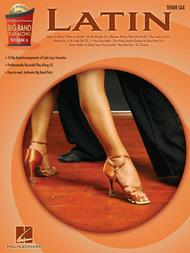 Published by Hal Leonard (HL.843127).ISBN 1423458753. 9x12 inches.Accessible and authentic big band arrangements for 10 hot Latin grooves, including: Água De Beber (Water to Drink) • At the Mambo Inn • Bésame Mucho (Kiss Me Much) • The Look of Love • Mambo No. 5 (A Little Bit of...) • Mas Que Nada • One Note Samba (Samba De Uma Nota So) • Quiet Nights of Quiet Stars (Corcovado) • Ran Kan Kan • St. Thomas.